The City of Kielce has recently become one of the first cities in Poland to obtain World Council on City Data (WCCD) ISO 37120 Platinum Certification. What does this mean for the city? How will the city take advantage of WCCD ISO 37120? Why did the city decide to develop the Smart City 2030+ Framework Strategy? The following is a conversation between Szymon Ciupa, WCCD Support Partner in Poland and Mr. Wojciech Lubawski, Mayor of Kielce City, and Ms. Jadwiga Skrobacka, Manager of the Office for Intelligent Management of Sustainable Development at Kielce City Hall. Good morning. First of all, I would like to congratulate you on obtaining WCCD ISO 37120 Platinum Certification. How do you understand the idea of a smart city? How is it implemented in Kielce? Does a smart city have to be a great metropolis? Can a medium-sized city also be a smart city? Wojciech Lubawski, Mayor of Kielce City: I have no opinion on whether a smart city is supposed to be a big, medium or small city. I know that Kielce can be a smart city because I am the Mayor of this city and I observe the processes that take place in it. We fulfill the requirements of the WCCD - the institution that certifies cities with the WCCD ISO 37120 standard while promoting smart city ideas. Changing a city into a smart city is a long-term process because no single administrative decision can make the smart city a reality at once. Obviously, the certificate also cannot be achieved overnight. The City of Kielce, Poland, was awarded WCCD ISO 37120 Platinum certification in January 2018. This also applies to many activities. We constantly revolve around various types of ratings and evaluations. These rankings often use different methodologies and arrive at different conclusions. When two studies arrive at extremely different evaluations, it means that mistakes have likely been made. But there are also institutions like the WCCD, which are simply reliable. I think the WCCD ISO 37120 Platinum Certification we have obtained is a new challenge for us, but it brings together a variety of activities analyzed by different entities and is so reliable that we do not question it at all. We believe that all the data and indicators that were prepared there are valid. Are the findings good or bad? They are varied. We know that if we do well in one area, we may do worse in another. But that doesn’t mean that we have to settle with this, because the goal of each mayor, the goal of local government, is to raise all these standards to a higher level. One approach to managing the city is talking to people, drawing your own conclusions from this and doing things very independently. But you can also use certain instruments that have already been practised all over the world. And the objectivity resulting from the second approach has the most credibility. Making the wrong decision can affect the quality of people’s lives. And that’s why all this data, knowledge and statistics are extremely necessary. Today, we can ask ourselves, should we take a different direction on an issue? Where should we be paying more attention? We might discover that we should allocate more money on something that is needed and expected by residents, or discover through those external entities what our strengths and weaknesses are that should be dealt with more thoroughly. That is the aim of certification. Taking into account the scale of working in local government, our capacities in some areas are necessarily limited. Not everything can be under our control, and now it is important to assess whether our challenges result from our ignorance or our conscious actions. I think that this type of certificate and the indicators included in it help us manage the city because the world is rushing forward and today, a smart city means much more than simply setting the traffic lights on green and red. It involves a lot of decisions that determine how we will live not just one month ahead, but even 10 years ahead. So there is a need to build this perspective, to be responsible for it and to subject oneself to certain assessments by objective entities, just like in the case of ISO standards, which have established credibility. It is difficult to disagree with these evaluations. S.C. Yes, the WCCD ISO 37120 standard is a reliable standard. So far, the cities that have decided to implement it are those that have ambitions to consciously approach development. We already know why the city has decided to implement this standard, but what other benefits do you see in the entire certification process? The certificate itself and the provision of data are obviously one thing, but the certification process itself was also not easy. It required not only the involvement of employees but also, I would say, a reflection on the whole city. Do you think that the city has already gained any benefits? W.L. : The fundamental advantage is that we submit ourselves to certain procedures that may not be convenient for us, but improve our decision-making overall. People often follow the path of least resistance, but they should be aware that they may have poor outcomes if they make decisions that do not reflect research. This is one thing. And the second thing is that as one of the first WCCD ISO 37120 certified city in Poland, it is worth being a leader, it is worth being the first one because it brings promotional benefits. Maybe this is a kind of reflection for the future - that it is worth boasting of these titles a little bit more, and of our achievements because residents need to know they live in a city that cares for them and strives to provide a high quality of life. S.C. I also think that thanks to knowledge about the city, one can identify problem areas and start solving these problems. Ms. Jadwiga Skrobacka, Manager of the Office for Intelligent Management of Sustainable Development: I think it is worth adding that a culture of data is developing at the moment. It was mentioned by Dr. Patricia McCarney, the President and CEO of the WCCD, in a congratulatory letter after we obtained WCCD ISO 37120 certification: “The City of Kielce contributes to the dissemination of this data culture.” I think that the point is to make everyone, both residents and decision-makers, aware that decisions are made on the basis of real data and real information. The reality is dynamic and the data changes with it. If we ensure that data is made widely available to decision-makers and residents and is always up-to-date, then it’s easier to understand why the city makes a particular decision. Everyone looks at decisions from their point of view and sees only a fragment of reality. But describing the context in more detail and showing it on the map, just as we try to do it, seems to create much more opportunity to include residents in the process. It seems to me that this is what has changed so much in recent years, that including residents in the process is more common and that in the smart city idea, data sharing is crucial. W.L. : Certainly yes. We must also be aware that thanks to access to the Internet, everything is more transparent. At the same time, I would divide this knowledge into two areas. The first one is very technical. We engage with the recipients of this knowledge as professionals, who often represent industry specializations. And then there is the second area - common knowledge. It must be different, it must be understood because if we speak a very technical language, it will be boring and inaccessible to people. We must, therefore, be able to translate this into a universal language. Today, access to data is completely different and better than 5, 10 or 15 years ago. For example, we now have GIS mapping, but before it was built, people had to rely on their intuition or go request information from an official. Today, officials are no longer needed to acquire most of this information, because people have access to data. If someone is interested, they can access the map. If they have a question, they can get a response via the Internet. So it is a completely different world, and the world will continue to develop in this direction. Any inhibition in this area will reflect badly on the city, so we have to develop it in this direction. And it is very good that there are institutions that can supervise it and certify it. We do not need to reinvent things that have already been invented in the world. S.C. It’s very important what you said, that the message or information made available must be adapted to the group of recipients. A city can adapt different methods of information distribution for elderly people, young people, specialists, or entrepreneurs. I’m glad you paid attention to this. I would like to go back to one aspect. With objective information, residents can also assess the quality of life and service provision in a medium-sized city such as Kielce in comparison to other cities. Recently, a lot has been said about how the idea of a smart city presents a big opportunity for medium-sized cities, which can change a bit faster than huge metropolises that are even more complicated in management. I would also like to ask a question about being the leader. 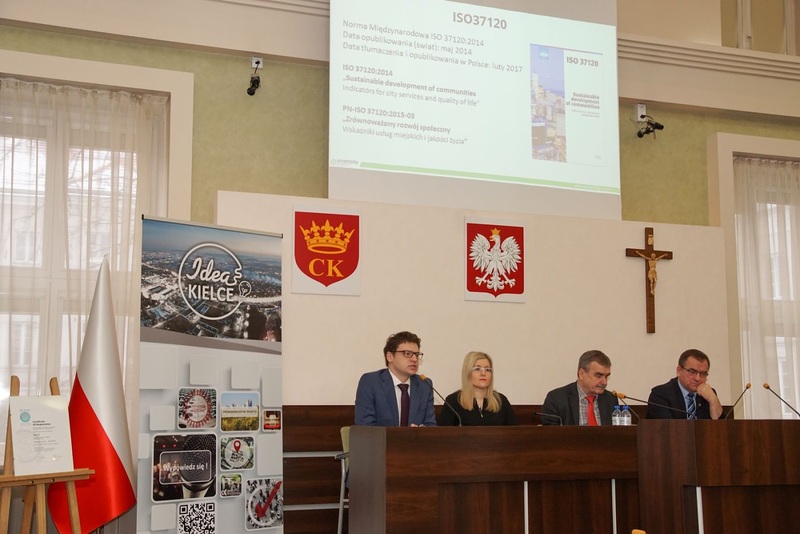 Kielce is one of the first cities in Poland to systematically organize its activities related to smart cities and has launched the Smart City 2030+ Framework Strategy. What kinds of benefits does the city gain through this strategy? W.L. : As I said before, this is a long-term process and it cannot be done overnight. Before a decision is made, we have a whole consultation process with experts and others - architects, engineers or other specialists who may have a different opinion than mine. Today, however, we face challenges that require common knowledge and input from residents. Implementation of the smart city idea should also involve consultation with other cities. We should think about solving common problems together. There are also new issues that arise from year to year. For example, almost no one spoke about smog three years ago. Was it there? Of course, it was. However, it was not as widely discussed or as thoroughly examined as it is today. S.C.: There was no widely-shared knowledge. W.L. : There was no knowledge. So, next year there will be something else, and in two years this will be something completely different. And we can ask those who already have experienced these challenges since they arise at different rates in different parts of Europe. One very wise proverb says “It is better to learn from the mistakes of others.” Therefore, activities such as implementing the smart city idea mean that we are able to learn from other cities’ experience and avoid mistakes. Someone has made a mistake once and we can draw some conclusions from it. On the other hand, it’s impossible to follow all the media, watch and listen to everything when you are a city mayor. There are appropriate institutions that report these challenges and lessons, like the WCCD, which have experience in this process and know it very well. It’s a process that we have been reliant on for years. There won’t be a point when we say that we are ending this experience because we already know everything. No, it will be ongoing. There will be new problems to be solved. J.S. : Mr. Mayor emphasized the often underestimated educational aspect of smart cities. In the smart city, everyone learns, both the employees who have their responsibilities and the residents who are informed about the city’s activities. It becomes possible to agree on common directions. Everyone should agree on certain key values, according to which we imagine the future of our city, and these values guide the various activities that we will undertake. I think it is often the case that there are different actors who always look from their point of view and see only a fragment of reality. However, if there is, as the Mayor said, a conflict, the points of view of various stakeholders must be presented, and this combined with reliable data allows us to reach a common agreement for all residents. It becomes easier to prioritize investment decisions because not everything can be done at once. I also think that the educational role of city-to-city learning is very important. Everyone here learns a lot. S.C.: Exactly. Thank you very much for the interview and please accept once again my sincere congratulations.